A few months ago, my mom and I started discussing some design updates for her home and she gave me free reign of my childhood room to transform into a guest room for friends and family she hosts regularly. I shared some initial design ideas for a few rooms back in March, and have been slowly collecting a few decorative accents over the last few months. My mom lives in the Texas hill country in an adobe house. She is drawn toward southwestern designs with light walls, religious portraits and natural wood stains. I shared some of my initial design ideas with her and she provided feedback like "love brightly colored textiles and wood furnishings ... not so sure on metal pieces or yellow lamp". Since she gave me free reign of my childhood bedroom, while she's traveling this summer, I thought it would be the perfect opportunity to spend a few weekends at her house working on this room for her future guests. I spent several nights pulling together her preferred style and colors into a design board, keeping in mind use of the four-poster bed that is already in there. I like the look of rustic and antique items with a hint of modern thrown in as well. I may not wind up using that Urban Outfitters chair in this space but I definitely want to use it for a project in the future. Also, I plan to build a new side table for this space and am drawn toward something with spindle legs like the white one above or perhaps like this one. I would probably stain them rather than paint though to tie in better with the rest of the furnishings. Along with the rest of the home's design, the main source of my inspiration for this space was the Inn of the Governors in Santa Fe where Keith and I stayed on our winter road trip earlier this year. The hotel room that we stayed in was beautifully decorated and I want to try to capture the essence of that room in my old bedroom's space. I took an image in the hotel room that I keep thinking of while looking for furniture and decor for this space. I loved the bright wall tapestry over the bed paired with the simple white bedding and colorful throw pillows. I also desperately wish I could have brought that old beat-up dresser home with me. I've been keeping an eye out on Craigslist and in local thrift shops for a similar dresser that I could fix-up and restore but have yet to find one. I am also trying to find a galvanized metal mirror for the room as well but for now, I've at least narrowed it down to a color scheme and bought the white dream-catcher in the design board to hang above the four-poster headboard. I plan to drive down in the next few weeks to paint over the chartreuse accent wall I added in high school and match it to the other three white walls. Once that's complete, I'll share some progress photos. In the meantime, please keep an eye out for an antique, distressed dresser in the Central Texas area and send photos if you find one. Sources: Color scheme from Benjamin Moore paints (Salsa, Castle Peak Gray, Spring Thaw and Mirage White). Woven rug from Anthropologie. 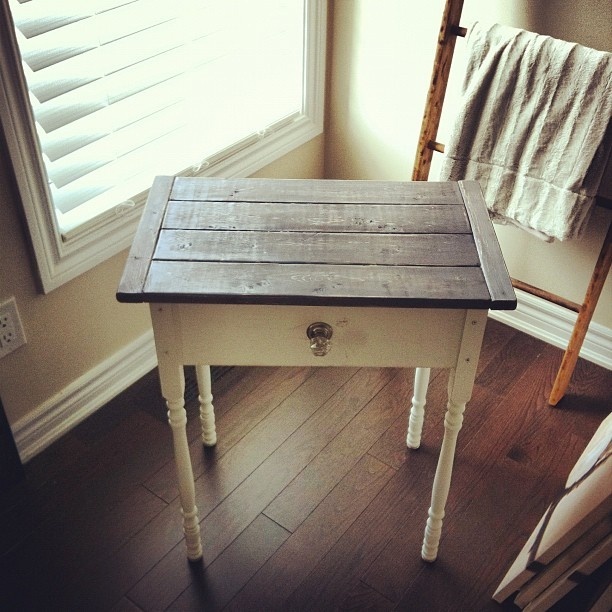 Side table from Cottage & Bungalow. Chair from Urban Outfitters. Four-poster bed from Dooley's Furniture. Skull art and lamp from World Market. Dream-catcher from One Kings Lane. Mirror from Concepts Ornate. Wool blanket from Pendleton.